Kode Professional Absolut Repair Conditioner was formulated for hair that has been chemically treated and for hair that is frequently styled at high temperatures (hairdryer and straightening iron). This conditioner is especially beneficial for those with damaged hair. It helps build and repair the hair's structure, improves hairs elasticity, and renews sheen and softness. Kode Professional Absolut Repair Conditioner protects the results of smoothened and damaged hair using a dual formula of keratin and enriched amino acids. The amino acids renew the interior of the hair and create an external protective layer that seals the hair and reinforces the keratin's effect, strengthening the hair's resistance to breakage, heat damage and chemicals. 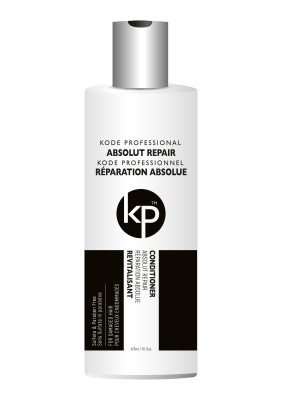 The Kode Professional Absolut Repair Conditioner is salt and sodium chloride free.